VANCOUVER, April 24, 2018 /CNW/ - Hannan Metals Limited ("Hannan" or the "Company") (TSX.V: HAN) (OTCPK: HANNF) is pleased to present initial results of processing and interpretation of the 40.6km seismic survey completed at the Company's Kilbricken zinc-lead-silver prospect and extensive 35,444 hectare Clare project in County Clare, Ireland. 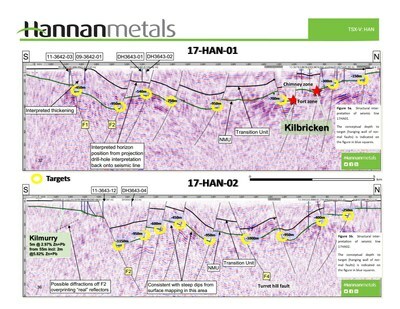 The 40.6 line kilometre 2D seismic survey identified the high-grade zinc mineralized position at Kilbricken (Figure 5a) and defined multiple new high priority targets in similar settings over a combined 12 kilometres trend immediately along strike and up dip from the Kilbricken resource (Figures 1 to 3). In total the Clare project now has 68 kilometres of 2D seismic and 5 square kilometres of 3D seismic surveys which constrain depths and geometry of potentially mineralized targets, which will substantially decrease exploration costs and increase exploration effectiveness. Mr Michael Hudson, Chairman & CEO states, "In the search for the next giant zinc deposit in Ireland, bold new strategies are required as exploration moves to deeper and untested levels. Reflection seismic presents an opportunity to use new data to think differently in a well understood geological environment. This survey has re-written the geological understanding of the Clare basin and opens the door to a new generation of major zinc deposits. We look forward to drill testing these exciting targets." The regional seismic survey is a first for the area and has delivered a critical new set of subsurface data across Hannan's 35,444 hectare prospecting licence. Combined with earlier surveys, Hannan now owns 68 kilometres of 2D seismic and a 5 square kilometre 3D seismic survey. The Company has also invested in the processing of historic seismic data acquired in 2011 and 2012 by earlier operators, to refine structural architecture interpretation and substantially decrease future exploration cost and risk. 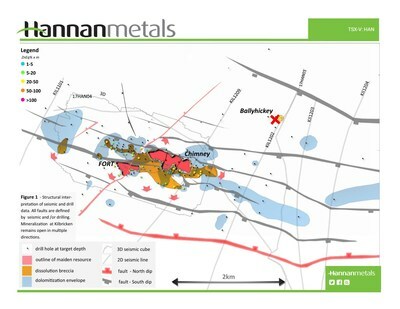 Base metal mineralization in Ireland is consistently developed within well-known stratigraphic and structural settings. The seismic program not only identified the high-grade zinc mineralized position at Kilbricken (Figure 5a), but defined multiple new targets in similar settings. This includes a highest priority 12 kilometre long trend immediately along strike and up dip from the Kilbricken resource (Figures 1 to 3). These new and untested targets in combination with Hannan's extensive soil sampling presents form compelling drill-ready targets across much of the Clare prospecting licence (Figures 4, 5a and 5b). 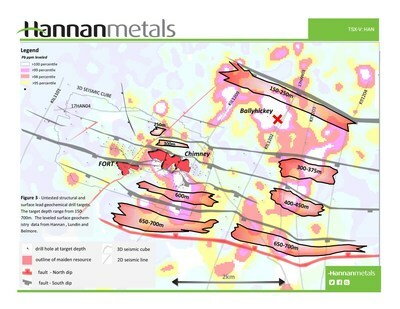 Importantly, it has been previously well documented that north-facing faults in the Irish Midlands zinc district which dip away from interpreted topographic highs, may preferentially host economic deposits. Major north dipping faults in the new seismic data are therefore considered significant, both on the southerly extent of Kilbricken, and 9 kilometres south southeast at Kilmurry, where 5.0m @ 3.0 % Zn+Pb was drill intersected in an interpreted footwall position adjacent to a large north dipping fault in the seismic dataset. This area is coincident with anomalous zinc and lead surface geochemical sampling (Figures 4, 5a and 5b). Seismic surveys use sound waves to map features beneath the earth's surface. A convoy of specialized vehicles (Vibrators) generate the sound waves which travel through the earth and are reflected back to surface from geological layers. These faint echoes are recorded by sensors, which are then processed to produce images of the underlying geological layers and structures. The seismic technique has advanced rapidly over the recent years as researchers adapt and introduce new methods, algorithms and approaches with increasing computing power. Hannan is one of only a handful of hard rock exploration companies to use the method globally. A variation on the seismic method won this years' Disrupt Mining competition at the PDAC in Toronto. The seismic survey was designed by Hannan, together with its geophysical consultants and was carried out by Gallego Technic Geophysics and Rees Onshore Seismic Ltd. A crew of 34 people performed the survey. Three north-south lines and one east-west tie line were completed to test for structures in multiple orientations (Figure 4). IMC Geophysical Services Limited were selected to process all of Hannan's new data. Charles Hope acted as client representative and quality control for the survey design, execution and processing. Glenn Morgan from Morgan Geophysics acted as quality control during processing and conducted the interpretation of all seismic data. 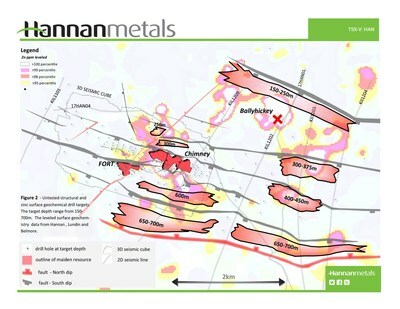 Hannan Metals Limited has 100% ownership of the County Clare Zn-Pb-Ag-Cu project in Ireland, which consists of 9 prospecting licences for 35,444 hectares. Zinc remains in tight supply amidst rising demand and stagnant supply. Ireland is a leading global jurisdiction for zinc mining and exploration. In 2015, Ireland was the world's 10th largest zinc producing nation with 230,000 tonnes produced. 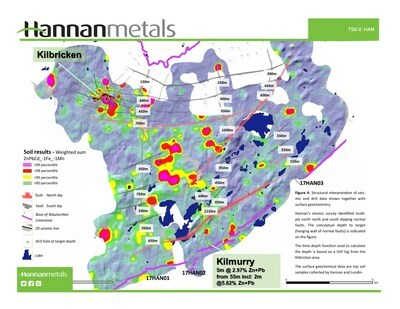 The maiden mineral resource1, dated July 10, 2017, immediately ranked Kilbricken as one of the top ten base metal deposits discovered in Ireland by tonnes and grade. Total indicated mineral resources were calculated as 2.7 million tonnes at 8.8% zinc equivalent ("ZnEq"), including 1.4 million tonnes at 10.8% ZnEq and total inferred mineral resources of 1.7 million tonnes at 8.2% ZnEq, including 0.6 million tonnes at 10.4% ZnEq.